1. In a large pan, boil 2 cups of water. 2. Add a teaspoon of oil and salt to boiling water. 3. Reduce the flame to low and add rice flour little by little and stir continuously. Once all the rice flour is added, turn off the flame. By now the dough will have a crumbled look with all the water absorbed. Allow the dough to cool down for around 10 minutes. 4. Transfer the dough to a working surface and knead for couple of minutes. 5. Take small lemon sized piece of dough and roll into small circles. Use rice flour for dusting. 6. 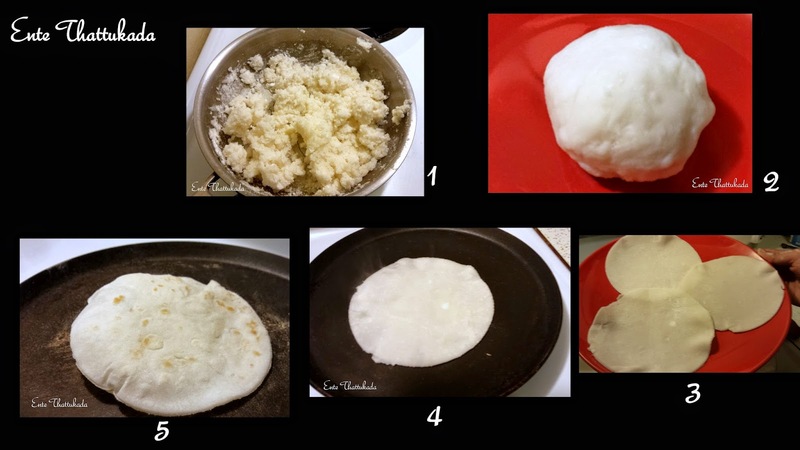 Transfer the rolled pathiri on a hot griddle and cook on both sides on medium-high heat. Don't apply oil on griddle while making pathiri. Serve these pathiri/akki roti with chicken curry/egg curry/vegetable kurma/tomato chutney.